A few days ago I forgot the "/eng/" and ended up at the Dutch page (www.bakfiets.nl), where I was able to recognize the words "newest accessories" on a popup. Oooh, sounds interesting! The first accessory that caught my eye was this, to make a small lockable box in the cargo area with the folding seat as the lid of the box. 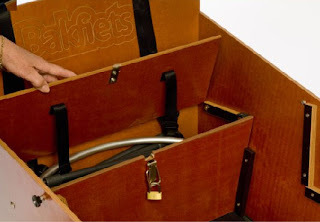 In the two weeks we've had the bakfiets, lack of secure storage has been one of the first things we noticed. We've had to decide between leaving blankets, thermos, etc unattended when making a quick stop at the store on the way to a picnic, or packing them in with us. It doesn't look like it would be too hard to make, as long as someone had some basic woodworking tools and the talent to use them. 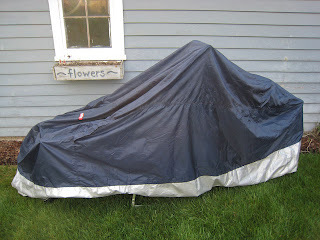 A convertible rain cover! How cool is that? I had been sketching out ideas to make my own, but this looks a lot better than anything I could have put together. A cover seems essential here in the rainy Northwest, but my understanding of the Clarjis cover is that you're pretty much committed to it once it's on, at least for that ride. This convertible option would be great on those beautiful spring and fall days when the sun's shining, but a shower could break out at any time. So where's the sign up list? I need both of these. 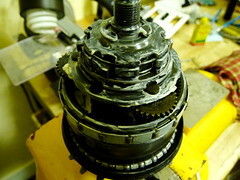 Courtesy of cleverchimp, here's a photo of the inside of the Shimano Nexus 8 hub on the bakfiets. Not my particular bakfiets, mind you. I've always wondered what was going on in there. p.s. anyone who gets the title reference and how it relates to this post is a super-geek. 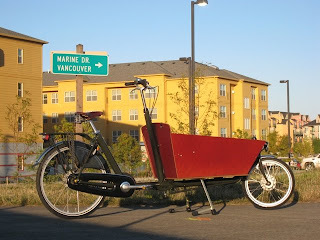 Can a Bakfiets make it across the I-5 bridge between Portland and Vancouver without scraping paint? Is there room to squeeze between the bridge columns and the rail? You might not want bomb across it at high speed, but there's plenty of room. This photo was taken going north on the southbound side (yeah, yeah, deal with it) at its narrowest point. I'll go back later to see how it fits on the narrower northbound side. I took a tool to the Bak for the first time today. Nothing much, I just adjusted the brake levers slightly. From the factory, they come facing quite far down. I'm pretty sure the human wrist just isn't meant to bend this way. Maybe if I were 7 feet tall and reaching down toward the handlebars, this arrangement would work. But I'm not and it doesn't. I understand that they're set up this way so the levers don't hit any passengers in the head when turning, but my only passenger is thirteen months old and has at least a foot and a half of growing to do before this becomes a concern. And maybe by that time I'll have grown the foot and a half I need in order for the downward facing brake levers to be ergonomically viable. Spin the wheel, squeeze the brake lever. Nothing happens. Adjust the barrel. Nothing happens. Adjust the barrel more. Nothing happens. Adjust the barrel the other way. Nothing happens. Adjust the barrel back to where it started. Trace the cable back under the box, up to the handlebars, and out to the lever on the opposite side from the one I was squeezing. 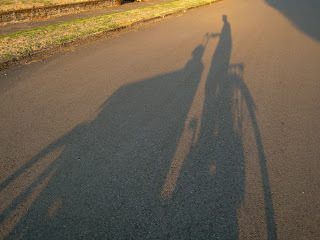 The bakfiets runs the front brake to the right lever, and the rear brake to the left. I did not know this an hour ago. Rode the Bak down to the grocery store today. About 7 miles total, downhill on the way there and uphill on the way back. It was the first real ride since the ride home on Sunday. The bike seemed much heavier & harder to pedal than the Bak I rented last month. I know the new version is slightly heavier and has a different seatpost angle, so I thought that must be the reason. Then I got home, put it on the stand, and gave the front wheel a spin to see how the generator light looked. No spin! The front brake was dragging. No wonder it was so much harder to get around than I'd remembered. I feel silly now, knowing what the problem is, but I honestly thought then that that must just be what it was like getting 300 pounds of bike + me + baby + groceries uphill. It was after dark (which is why I was playing with the light), but I found the adjustment barrel and was able to back the brake off slightly. A good spin of the wheel will now get maybe two or three revolutions. Still nothing like free rotation. Sunrise will bring a closer inspection. Home is in downtown Vancouver, about a dozen miles from Clever Cycles. I'd never ridden that route before — in fact, I haven't ridden in Portland other than an occasional weekend ride through Waterfront Park and the Eastbank Esplanade and when we lived there five years ago. That Esplanade was the first stretch of my route. Move it, roller-bladers and skate punks! Don’t you see I’ve got a 100lb, eight-foot-long bike, and I’m not used to steering it? Save yourselves, get out of my way! Switchbacks at the north end of the path proved a little bit difficult to navigate due to the turning radius of the bike, but they were nothing that couldn’t be handled with a wide turn as soon as it was clear. I headed up Williams, cut across on Killingsworth to Denver and followed that until it joined Interstate near Portland International Raceway (if there's a better route, please let me know), then up through Delta Park to the maze that is the bike path system between there and the I-5 bridge. The dreaded I-5 bridge. 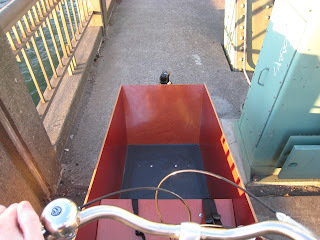 Here I was riding a huge bike with a wheelbarrow box in front, on a path that had always seemed to be only one inch wider than the handlebars on my regular bicycle. Slow and steady, I threaded the needle — OK, so it was a little wider than I thought — and was finally on familiar ground. I’d actually ridden from here on the Bakfiets we rented earlier in the summer, so I knew it was no problem getting up the hills to home. Except that when I rode before, I hadn’t ridden 10 miles immediately prior. Oohhhhh, my achin' legs. But I made it. The bike and I were safely home. Total distance: 12.75 miles. Total time: 2 hours (including stops for photos, text messages, and drinking fountains). Total calories burned: seventy-bazillion. Total smiles and waves: I lost count. At long last, I got the call that our Bak was ready! We all piled in to the car and headed for Clever Cycles. The shop was busy, so we spent a few minutes checking out stylish helmets for my wife, Sara, before we were helped. "I'm here to pick up my Bak!" My grin must have been ear to ear. After paying for it and making sure that serial numbers matched between the bike and the paperwork, Dean led us outside where our Bak awaited. He went over some of the differences between this and the previous version — things like the seat post angle, the rack construction, etc. 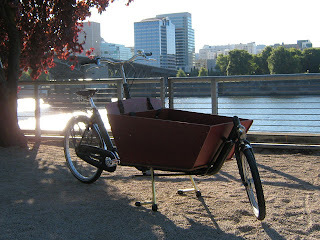 Sara joked that there was no need for the overview, since I'd done nothing but scour the web for Bakfiets blogs, sites, FAQs, and photos for the last two weeks. After a brief preflight inspection and a spin around the block, it was time to get serious. I had to ride home. I kissed the wife and baby goodbye, and headed down the road.